Suitable for supermarket, Banks, exclusive agency, chain shops, large-scale sales, star-rated hotels, restaurants, travel agencies,Hospital information center,personal computers,Education,,offices, pharmacy,department store,etc. GreenTouch's desktop Touch Monitor use 4/5 wire resistive touch screen that independently developed and produced by our company,On the back of touch monitor left 75mm X 75mm spacing standard VESA hole for hanging installation,it can accept a multitude of common video inputs including multiple VGA and DVI. It has a high-quality, cost-effective, good durability, and stability character. Pure glass for touch screen also provides good clarity and light transmittance. GreenTouch's desktop touch screen monitors size from 10.4 to 22 inches, use 4/5 wire resistive touch screen that independently developed and produced by our company, it has a high-quality, cost-effective, good durability, and stability character. Pure glass for touch screen also provides good clarity and light transmittance. Slim housing and stylish design base, made the touch monitor with compact and elegant appearance. 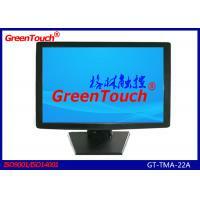 GreenTouch's desktop touch monitors Support AC 100 ～ 240V,50 ～ 60Hz,DC12V-3A. can accept a multitude of common video inputs including multiple VGA and DVI. very smoothly when touch and draw line.